We now have a dedicated fitting room (for those of you that don't necessarily want to be on display while getting fitted)!! If you have pain or discomfort while riding your bike, making sure that your bike fits YOU will improve your ride enjoyment . Meet Nicky. She is our certified, professional bike fitter at The Bicycle Shack. 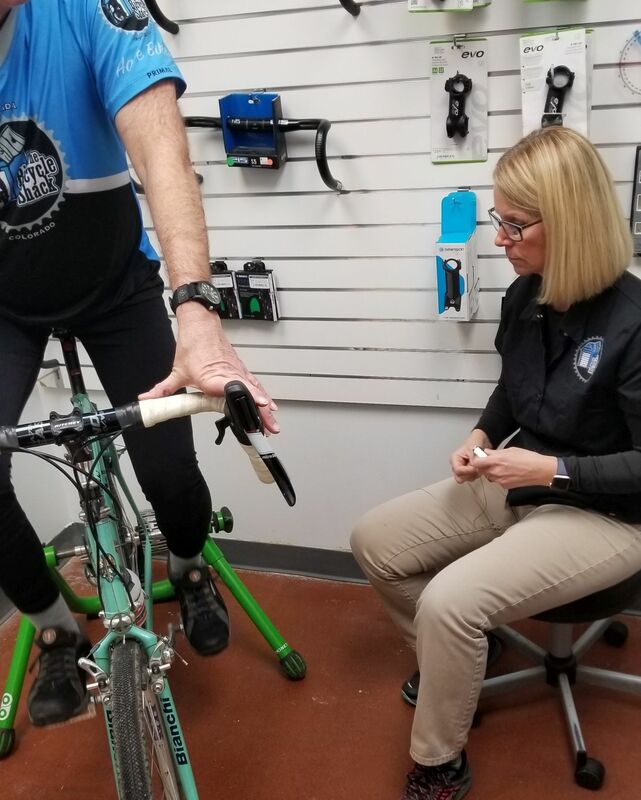 Nicky has over 10 years of experience in bike fitting, is Body Geometry certified, and is dedicated to making you the most comfortable you can be while riding. Call now and make an appointment with Nicky. This will be a detailed process which will start with an interview and proceed to a review of your ride style and bike comfort needs. Your body geometry and flexibility will be assessed. Before and after measurements will be taken of your bike. Changes and/or suggestions will be made regarding your bike at the time of fit (items may need to be ordered for fit completion). A professional fit will take about 1 to 1 1/2 hours to complete. Bring your bicycle, riding shoes, your riding gear (either wear in or change into). Call our shop at 720-432-4537 to setup an appointment. You can email us at the shop as well through our contact page.